As soon as November begins I start to wear a particular hat. It's an elderly tweed trilby which has probably been in and out of fashion a dozen or more times, and which to my amazement some of my younger friends tell me looks cool and stylish. I suppose I'm amazed because it belonged to my dad, who was a sensible rather than a stylish dresser; no doubt he's looking down on these compliments with bemused amusement! The hatband serves as a secure Remembrance Sunday poppy holder, and this year, thanks to an enthusiastic seller, it's especially resplendent. 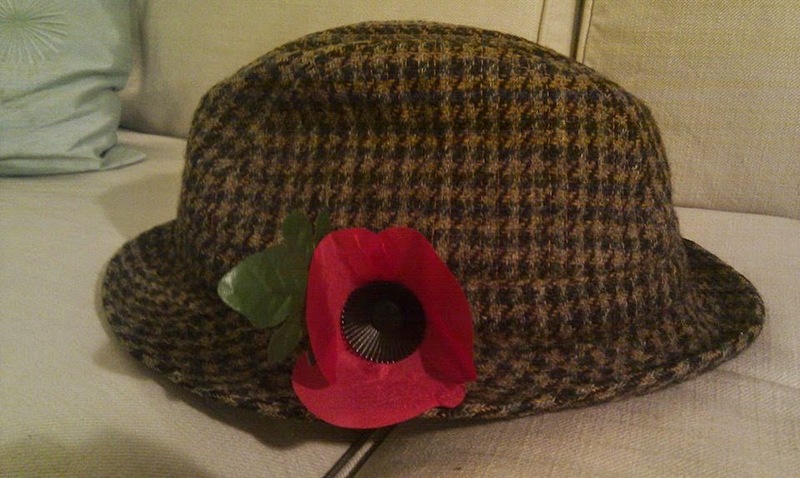 But my hat is much more than a stylish retro trilby with a jaunty poppy stuck in its band. My mum died on 11th November, my parents lived through the War and both my grandfathers fought in World War I, so it is remembrance on so many levels, reminding me of so much love and sacrifice each time I wear it. But November for Catholics is the month for remembering and praying for all our dead, whether they were in a war or not. And for me this month, only a week old, is already filled with news of three deaths from three parts of my life: two unexpected - one of them a complete shock - the third anticipated but no less sad. Three men who in different ways have been part of my life and are now part of my memories - which the internet and their social media accounts are helping to preserve - and newly included in my prayer. They were not my closest friends, but each has been significant for me, and I have valued the gift and the friendship of each one. May they rest in God's peace, and may all who love and mourn them - including the parishioners of the priest who has just died so suddenly and unexpectedly - find peace even as we grieve for our loss.